After finally unpacking the last few boxes from our move 15 months ago, I made it out for a run on Red Hill yesterday. My coach Lindsay had me doing three 15-minute hill repeats at a running/hiking pace. 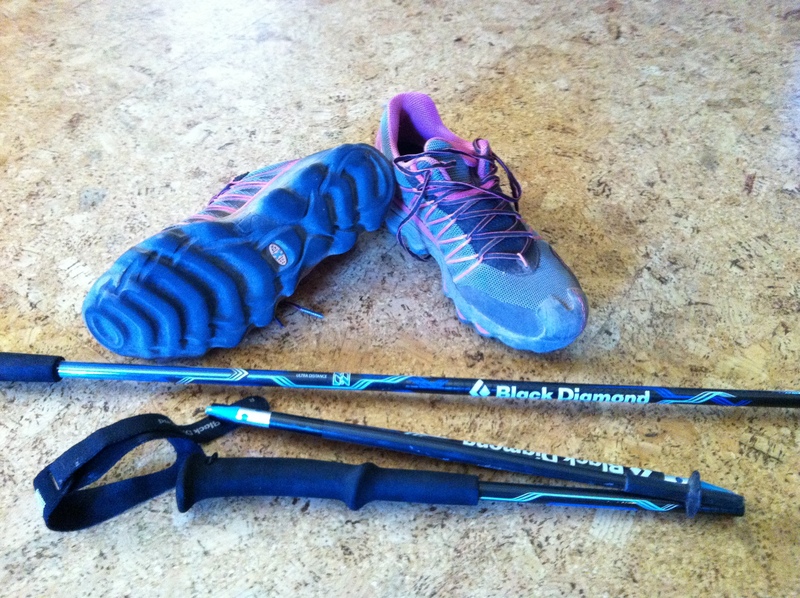 It was the perfect opportunity before my adventure race in Tasmania to try out the new ultralight, folding, carbon fiber Black Diamond Z-Poles as well as a new pair of Quantum trail shoes from La Sportiva. I started with a few fun miles of warm-up on the road while Juniper rode her bike alongside. After dropping her off at a friend’s house I got down to business and headed up Mushroom Rock. As I got closer to the top I realized the climb was not going to be quite 15 minutes. So I tried for consistency and finished my hill climbs in 12’55”, 12’36” and 13’24”. Somehow I made a wrong turn on my final climb. I was able to use the Z-Poles in many places both climbing and descending and they were really helpful. When the trail leveled out a bit I carried them, and hardly noticed because they’re so lightweight. Admittedly, I’ve never really been a fan of hiking poles but now I’m looking forward to using them in Tasmania. Tasmania is going to be a long race, so I thought the new Sportiva Quantums with their MorphoDynamic technology would feel nice and cushy after being on my feet for four or five days. But, before trying them, I was a little worried the shoes would feel inefficient, as if I was being sucked into the thick outsole. But, on the road and on the trail, I was totally impressed by how good the shoes felt. I felt nimble and super stable even on the technical descent. The traction was superb as well. Instead of using the Quantum for the last few treks of Tasmania, I may have found my new everyday trail shoe. Overall, I felt strong even after a long day of training on Saturday. Hopefully I’m ready physically and mentally. Now to make sure my bags aren’t too heavy.